Strong, sturdy, and stable cash drawers are a must-have in any place that conducts cash transactions, while a sleek and beautiful design that enhances the surrounding decor blends functionality with desirable aesthetics. APG Cash Drawers are regarded as top industry products that deliver exceptional durability and reliability in use. With APG’s cash drawers, transactions happen quickly and securely, so businesses can improve efficiency and increase customer satisfaction. Virtually no maintenance is required on APG’s cash drawers, allowing businesses around the globe to keep moving forward without missing a beat. APG Cash Drawers are beneficial for a wide variety of environments, including hospitality, quick-serve, retail, and grocery settings. 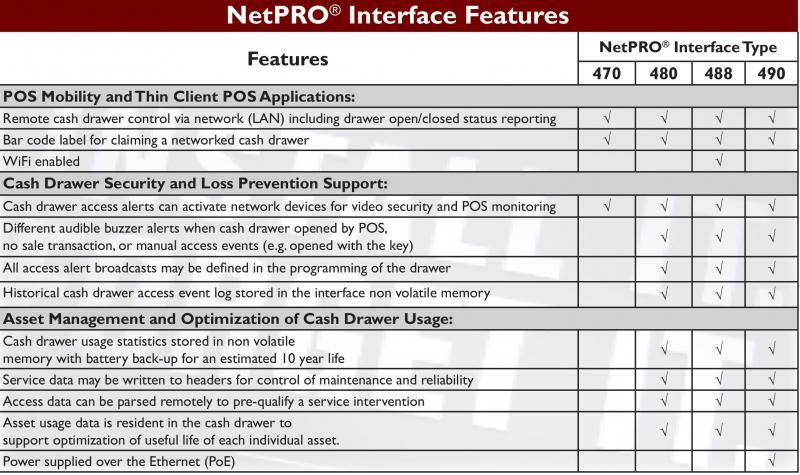 With smart technology integration including Bluetooth connectivity options - and a diverse array of options featuring varying interfaces and integration features - there is a customizable cash drawer solution from APG to improve business transactions at any enterprise. With flexible storage space and customization options, the industrial-grade materials that make up these cash drawers make them one of the most sought-after, reliable models on the market. The Series 4000 Cash Drawer is an APG stand-out, powered with a multifunctional lock, POS platform integration, flexible media storage, coin roll storage, and resilient materials to keep this drawer working optimally every time. The Series 4000 Cash Drawer is a perfect choice for theaters, home centers, and convenience/gas station environments. Powerful but compact, the Series 100 Cash Drawers improve the efficiency of any workstation. With ample storage space for packaged currency and rolled coins, as well as an adjustable media slot divider and other configuration options, this small but mighty cash drawer provides businesses with everything they need to handle fast and secure transactions. Night clubs, fast food restaurants, and sporting goods retailers will benefit from the Series 100 Cash Drawer. For businesses that want a tablet-based POS system with the same security that is expected from APG, the Stratis Integration System melds the use of a tablet with elegant and non-invasive design. The tablet is able to face both the customer and the clerk, making it a sleek, customizable option that moves businesses forward in the digital age. Stratis Series Cash Drawers satisfy the desire for “Point of Style” that retailers are looking for, in environments such as coffee shops and boutique stores. These standard-duty cash drawers are affordable options that retain strict standards on security and performance. Multifunctional locks, drawer status reporting, and customizable configuration make this an efficient solution for businesses counting on cash drawer dependability. The Vasario Series Cash Drawer is a perfect choice for food truck, bakery, deli, and dry cleaning businesses. APG’s Flip-Top Cash Drawers are extremely easy to use and provide exceptional speed during check-out. Integration with traditional, self-check, and mobile check-outs makes these a versatile option for in-store and on-the-go settings. The Flip-Top Cash Drawers are ideal for grocery stores. ScanSource has an extensive APG product line to provide resellers with all the products they need to set up their clients for success, including cables, locks, keys, mounting brackets, and more. Our expert team members can help determine the best recommendations for your clients. Part of why APG’s cash drawer products have been trusted by businesses around the globe for more than 35 years is because of the rigorous testing that is conducted on each machine to ensure top performance at every moment. Cash drawers, such as the Series 4000, undergo 4 million opening-and-closing tests before being sold, to guarantee optimal use each time, no matter how demanding the environment is. Besides conducting cycle tests, individual parts are also tested for durability and precision. Keys, locks, slides, latch mechanisms, and solenoids are all tested to ensure the entire product works seamlessly and never lets you down. Before designs are manufactured on a wide scale, they are tested in real retail environments so that the finished products are optimal for real-world settings. If you work with retail clients who need the best in cash drawer operation, APG’s cash drawers are top choices. Not only will your clients get a superior product, they also get the dependability of the APG brand. Selling APG’s cash drawers through a partnership with ScanSource allows you to grow your business while thrilling your current customers. Besides continually enhancing current product lines, you and your clients can count on APG to develop new product lines with improved technology to keep them a step ahead of the competition. To become a reseller of APG’s cash drawers with ScanSource, visit us here, or give us a call at 800.944.2432 to talk with a representative.